I’m going to hazard a guess that you’re not a big follower of eSports. Forgive me if I’m wrong but despite its huge reach and millions of followers, it often feels walled up within it’s own community. Which is why I arrived at the 2016 ESWC World League event in Paris a little unsure what to expect. I’ve seen plenty of pictures and videos of crowds in the past; competing teams and winners raising cups or oversize comedy cheques, but what does it feel like to be there? The answer is ‘basically like any sporting event’, only one with Call of Duty playing on Le Zénith arena’s large central screen. When I arrive on the Saturday the halls are packed with teenagers wearing pro-team shirts and pointing excitedly at the occasional players, streamers and YouTubers that wander past. At this stage things are fairly relaxed: the early rounds are more about placings so there's less pressures. Fans drop in and out as different matches take place, and wander outside among the concessions buying merchandise, food and lining up for autographs and selfies. For those that don't know how it all works, there are some strict set ups for The Call of Duty World League. For this competition the final stage starts with a bracket group of 16 four man teams, with the best two from each bracket qualifying for an eight team, single elimination, best-of-five play off. From there on it's 'may the best team win' (more on the rules here). At a competition level a very particular set of maps and modes are chosen for eSport events. In this case Hardpoint: Breach and Uplink: Evac on Stronghold, Fringe and Evac maps, while Search and Destroy is played across Fringe, Redwood, Breach, Hunted, Stronghold, Evac and Infection. Jay Puryear, Treyarch's director of brand development in eSports, explains more about how things are chosen at a professional level. “What we find with eSports is not all [content] is competitive, so they’ll weed out and restrict a certain amount. So they’re still playing the same universe, but just with a smaller subsection of content. So in competitive we don’t use tripmines or shock charges and there’s various other things that we don’t play with”. And just to make it clear how important eSports is to COD Jay mentions “we’ve already had players out at Infinity Ward”. At a time when most of the world have seen a reveal trailer, pro players are already looking at Infinite Warfare to help shape the competitive component. “Their feedback definitely helps development,” he says. “They play at such a high level they’re like ‘I expected you to spawn here’ or ‘if I control the map in such a way you should spawn over here’. So they really help with spawning and tuning or weapons and content – they have an opinion on all of that”. That’s something casually confirmed by pro-player Callum Swan, otherwise known as Swanny, over lunch - nodding that he’s already seen the game while joking about chips and carbs making making him sluggish when he competes. Speaking to Callum it's interesting to see the event from a competitor's point of view. He’s there with Millennium, one of the teams competing for the $20K grand prize so, right now, Call of Duty is his job. At a pro-level this isn’t a bunch of mates playing together, it’s part of a larger organisational structure with players effectively salaried via contracts and sponsorships. Millennium, for example, also have teams for Starcraft 2, League of Legends, FIFA, Hearthstone, Counter-Strike, Halo, and various fighting games. Unsurprisingly for a business with large amounts of money at stake, there’s far more to it than ‘just playing a game’. By the time I arrive on Saturday, Callum’s been there since Thursday: there’s accreditation to sort, the venue to check (the teams often play warm up matches to get a feel for the space) and other pre-show bits of busy work. It’s the Friday when things get serious, as Callum explains. Teams try to organise warm up matches (making sure they’re not actually playing against direct competitors). He called these little friendlies ‘scrimmages’ and they form a regular part of training that, when when competitions are close, can see people playing ten hours a day. “I think from the general perspective of someone who perhaps doesn’t appreciate the mechanics of the game or how we play it would strike them as fairly monotonous,” he says adding that while it might not have the physical demands of an athletic sport it is “mentally demanding”. Watching the matches in action there's an unmissable level of skill on display - improbable wall-running sprints that cover the map, and three or four killstreaks are the minimum standard. It's interesting to hear Callum break down what's going on from a pro perspective, especially the team interplay that’s often missed in the speed. "It’s important to have defined roles," he says. "So, for example, on an attacking round in Search and Destroy it’s going to be a faster paced player who grabs the bomb, because they’re going to be leading the charge. I'm going to be the guy covering him and watching over him". Elsewhere, he explains, it's about "which positions we take up on the map and how we defend that bomb site". It's not just raw skill and reactions that make a difference either - players are micromanaging a huge amount of info says Swanny: "Things like spawn timers, keeping track of when your teammates are on spawn, who’s alive, where are they on the map. Just as with any sport or any competitive platform at a professional level it’s those minor adjustments that make the major differences in terms of results". Even to my untrained eye some displays of skill are easy to see. Especially in Uplink (think basketball with guns) where the ball/drone is apparently thrown wildly into space to somehow score points way on the other side of the map. According to Callum that’s something practiced a lot to make sure team members are confident with their shots. The final day of the event has a completely different feel to Saturday’s relaxed buzz. There's no wandering between matches - everyone's glued to their chairs watching the final four teams play off: Millenium, OpTic, Rise Nation and Splyce. It's a day of cheering and jumping out of seats - with the prize nearly within reach every win and the tiniest mistake suddenly becomes incredibly important. Successive killstreaks are met with increasingly louder shouts and the occasional standing ovation, while some of those long range plays I mentioned on Uplink are rewarded with howling adoration and stamping. In the end, OpTic take the prize, beating Splyce to the $20,000 cheque. The crowd literally goes wild, chanting and waving while the shoutcasters live up to their name, trying to be heard over the noise. If you've never quite 'got' the idea of video games as a professional sport then try standing in the audience at a major event win and see how you feel about it then. That’s the end of this particular show but there’s still plenty of work to do. “We have other obligations such as we could be doing interviews,” explains Callum. “Autographs, pictures etcetera, especially at events such as ESWC where there’s quite a few fans there – unless we’re relaxing in the player room then we’ll usually go out and speak to fans because I feel like it’s justified when they’ve paid to travel the world to see... even if they’re fans of rival teams when they’re actually contributing towards eSports then it’s still supporting us in some way”. And obviously there are other events to prepare for. This event is only part of the year’s calendar, with Jay from Treyarch outlining various upcoming stages, regions and LAN tournaments all giving teams the chance to qualify for COD Champs, which he refers to as “sort of our Super Bowl”. There’s over a million dollars in prize money there, and that’s only part of the $3million being given away across all three regions with 30+ pro teams all competing for a cut. So, big money in play but for Jay and Activision it’s only the start. As far as the five year plan goes? “I think it’s really to establish Call of Duty as one of the top eSports titles. Grow the league from an organisational standpoint where we’ve got organisations that people are following, we’ve got stars in the players and COD is a standard”. 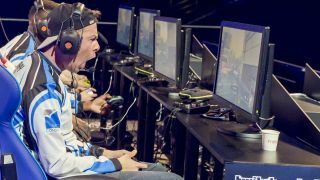 The world of eSports is slowly gaining more mainstream traction, with TV deals and a recently inked deal with Facebook to stream the MLG Anaheim Open, a two-day BLOPS tournament, directly in through the social platform. At this point it feels like it’s not a case of if competitive Call of Duty breaks into the mainstream, but when.